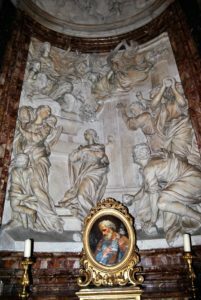 The altar dedicated to Emerentiana features a panel representing the 4th century martyrdom of this Roman saint, sculpted by Ercole Ferrata and Leonardo Retti. Ferrata died having completed only the lower part of the altarpiece, and it was Retti who finished the work. The scene shows the narrative clarity of the school of Alessandro Algardi, derived in turn from study of the Greco-Roman classics. Ferrata was considered Algardi’s most important artistic heir.